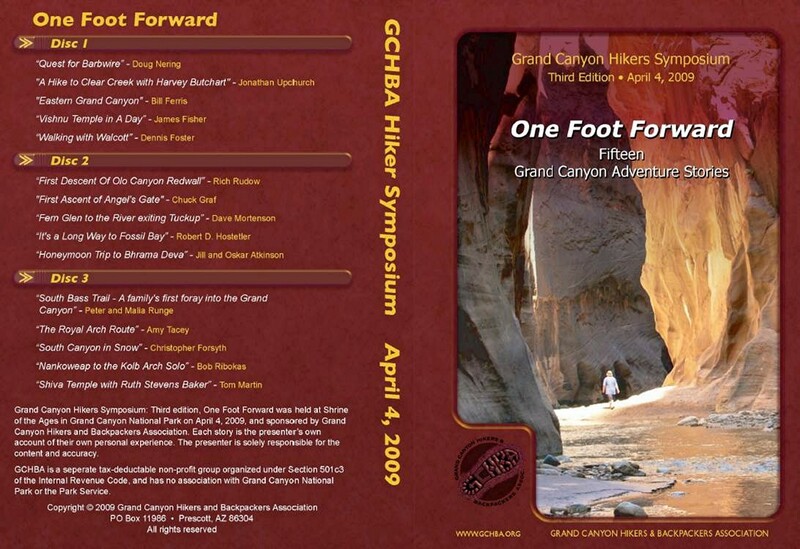 The GCHBA is pleased to announce the release of a DVD video showing the third Grand Canyon Hikers Symposium, which was held Saturday, April 4, 2009 at the Shrine of the Ages in the Grand Canyon National Park, South Rim Village. All 15 presentations are captured on 3 DVDs. The presentations cover a wide range of Grand Canyon experiences, including technical climbing, rim-to-rim hikes, exploratory hikes, and long-distance adventures. The cost of the DVD set is $23 including shipping to USA, $28 for Global Priority Mail to international destinations. And as always, your purchase goes to help support the non-profit GCHBA. As always, the purpose of this symposium was to share hiking, climbing and backpacking exploits, and explorations in the Grand Canyon. Harvey Butchart wrote, “The Horsethief Trail is straightforward, but very strenuous.” This was a very serious and even intimidating message to someone like me, older and slower and not anywhere near as fast a hiker as he was in his prime years of exploration. Water supply and rate of travel would be critical to accomplish this. Perhaps the most interesting and mysterious of the early historical trails of Grand Canyon, this was the one I wanted to complete more than any other. Working from a generous resource of information on mining and exploration shared by historical researcher Dove Menkes, there would also be things to look for along the way. In early September 2007, with hopes of finding historical signs from the early days we set out on “The Quest for Barbwire,” from Saddle Mountain and Nankoweap to Tanner and Lipan Point. Harvey Butchart is a legend to Grand Canyon hikers and backpackers, an inspiration to many, and a Canyon explorer to whom we are all grateful. In 1967 I had the privilege of hiking with Harvey to Clear Creek on a hike that allowed him to accomplish two missions – search for a reported natural bridge and explore a new route around The Howlands Butte. I’ll share several personal insights about Harvey, who he was, his personality, habits, hiking stamina, and how he was obsessed with the Canyon. I regard this hike as a “once in a lifetime experience” to share with you. Be prepared for some good humor. In October 2008, my friend Joe Sturm and I did a 5-day/4-night hike in eastern Grand Canyon. Departing from Tanner Trailhead on October 19, we hiked to Tanner Rapids, followed the Beamer trail to the confluence with the Little Colorado, returned to Tanner, followed the Escalante Route to Hance Rapids and finished our hike by taking the New Hance Trail back to the rim on October 23. Using photos and route maps, I’ll recount the experience and touch on the highlights from this hike in eastern Grand Canyon. According to the Grand Canyon Summits Select Book, it is only 6 miles. We left the trailhead parking lot just after midnight in September. After a bivy above the first rappel, we started out at around 8AM. The rappels went smoothly, as did the descent through the Supai. After a long traverse at the top of the Redwall, the climb of Vishnu went smoothly up to the top of the Coconino. My partner, Erik Baldwin was suffering from severe leg cramping, so I soloed to the top and back down as quickly as possible. We made it back to the bottom of the Supai drainage leading to the first rappel just after dark. Erik was going to meet another party to climb Wotans in the morning, so I found new ways through the Supai in the dark, ascended the rope and made it back to the car just before midnight. There were a few mini-epics along the way, including a slip in the Supai that I caught with one hand to avoid a 20 footer, ascending in the dark, and a mysterious creature on the final Kaibab ledges. This hike allowed me to complete a retracing of Charles D. Walcott’s 1882-1883 journeys in the Grand Canyon. Over that winter season, from November to February, Walcott traveled down the newly-constructed Nankoweap trail and as far south, and west, as Asbestos Canyon. My intention was to cover the section he traveled from Basalt to Unkar, along the top of the Tapeats. Modern hikers generally shun this route, in favor of the route alongside the Colorado River, or entering Unkar via the high saddle from Lava/Chuar. I was joined for this hike by Chris Forsyth. Our hike was aided by a crossing of the Colorado River in an inflatable kayak. Despite being mid-May, we were confronted with a cold and rainy night, with snow falling on the rims. Passing by old mining sites and Indian ruins, hiking along narrow ledges atop high cliffs to following well-worn trails along the river, this hike covered a wide variety of terrains in the Grand Canyon. Olo Canyon enters the Colorado River (river left) at mile 146. While river runners have explored the lower part of Olo, we were unaware of anyone attempting a full technical descent of Olo from the Esplanade down to the river. In October 2008 Todd Martin, Brian Alleyne, and Rich Rudow did what we believe was the first full descent of Olo on a four day and three night backpacking trip along an innovative route that required strong technical canyoneering skills and the use of pack rafts. This route started down 150 Mile Canyon off the North rim, crossed the river, ascended Matkatamiba Canyon (mile 148) to the Esplanade, descended Olo Canyon, rafted back to 150 Mile Canyon where we exited to the rim. The route traverses three slot canyons in one trip and avoids South Rim tribal access issues in this area. Olo Canyon proved to be absolutely stunning with three distinct sections of narrows starting in the Redwall. The backpacking adventure getting into Olo and out again will be shared along with stunning photography of a rarely seen place. In April 1972, Chuck Graf and Dave Ganci made the first ascent of Angel’s Gate, a spectacular peak rising high into the Coconino Sandstone east of the Clear Creek Drainage. This presentation will recount the 7-day backpack trip that culminated in the technical climb of this summit. This presentation covers a loop hike down Fern Glen Canyon and up Tuckup Canyon. In March of 1996 we used the Hermit Face route off the rim above Willow Canyon and then down Fern Glen on a one way repel trip to the bottom. On the day we hiked from Fern Glen to Tuckup it just happened to be the day the Bureau of Reclamation decided to flood the Colorado for a week. Unfortunately for us, being from the NW, we didn’t know about it. Caught half way between Fern Glen and Tuckup a research party camped at National Canyon literally saved me with a zodiac boat. My presentation will show the special route off the rim to get to Willow Spring and the unique beauty and untouched solitude of Fern Glen. I’ll also cover the amazing transition of the beach at Tuckup as it was flooded before my eyes as the river flow increased from 15,000 cfs to 40,000 cfs. I will relate how, on a clear day, a man-made flood almost got me. Four of us did a ten-day loop hike from Pt. Huitzil, down the Royal Arch route to the Colorado River, then along the river to the seldom visited area downstream of Elves Chasm (with a day-hike of Butchart’s Enfilade Redwall route by two of our party), then up Fossil Canyon to the Redwall rim with numerous water and climbing obstacles, then “hooking” back down Fossil on the rim to Butchart’s exit up the Supai to the Esplanade. We worked our way up to the head of Fossil Bay and looked unsuccessfully for the deep water pocket that Butchart and others indicated was quite likely to contain water perennially. All of our party agreed that this was the toughest Grand Canyon hike we had done. From the middle of our second day (near Elves Chasm), we didn’t see a single other hiker and, in fact, did not see any footprints except those obviously from boaters on beaches. We thought it would be wonderful to have our honeymoon trip be to Brahma Deva. We will present pictures, the GPS route we took, mistakes we made and of course, how and why we chose to do the Brahma Deva route for our honeymoon. There are as many views of the Grand Canyon as there are people to view it. My ten-year-old daughter and I will share with you our experience and views while hiking the South Bass trail last fall. It was our family’s first rim-to-river hike. We hiked the trail for two-and-half days, making it to the river and back to the rim. Our presentation will recount how we prepared for this hike, our expectations and what we learned along the way. I will present a hike Dennis and I did during the last week of January 2009. Since I was diagnosed with cancer over a year ago our goal was to get me healthy enough to do the Royal Arch Loop. Well, since I was able to stop chemo last March and have been keeping my cancer down with herbs and natural medicines we decided this would be a good time as I have been rebuilding and gaining strength. We booked the trip through the BCO in November which gave us plenty of time to train and get ready. The hike was 6 days and 5 nights below the rim visiting Toltec Pt., down the Royal Arch drainage, day hike to Royal Arch, up out of the drainage onto the Tonto, down the rappel to Toltec Beach, then onto Garnet Canyon, Copper Canyon and up to the esplanade then out. Marble Canyon in winter is a quiet, cold, and beautiful place. In this presentation I will describe a hike into South Canyon via the steep and direct route at the mouth of Bedrock Canyon. Highlights include snow-covered slopes, ruins, fossils, Stanton’s Cave, and the surprise of finding two nearby but dramatically different routes off the rim. In April 2006, I hiked Nankoweap to the Kolb Arch. My first day was Easter sunrise and hiking to Saddle Mountain, on Day 2 I followed the Nankoweap Trail to Nankoweap Creek, Day 3 I failed on a Nankoweap Mesa attempt, then on Day 4 I visited the Nankoweap Granaries and moved camp, on Day 5 I managed the Kolb Arch day hike, on Day 6 I moved camp again and explored around Mystic Falls, and on Day 7 I hiked out the Marion-Seiber Route. As a teenager, Ruth Stephens was part of the Kolb led party that climbed Shiva Temple in 1937. The planning for the first assent of Shiva and the climb was in secrecy, hence much of the “how did they do it” is lost to history. Ruth died a few years ago, and this presentation recounts how in June 2008, a party of 5 family members with 5 others attempted to scatter Ruth’s ashes on the summit of Shiva, how five folks actually made the summit for the ceremony, and how the entire party almost perished on the long walk home. 3 disk DVD set for US shipping: $23. 3 disk DVD set for international shipping: $28.